i always have a hard time actually FINISHING a room. i move in, get 1 or 2 new things and then just stop there. with this house, i am making an effort to polish the rooms with the details at the end. hang the pictures, get a new mattress (mine was yeeeears old), update your bedding, install new closet doors, hang the pendant light, paint the walls…it’s a slow process but feels really satisfying once it’s done! have you heard of leesa mattresses? it’s so cool that you can order it to your doorstep in a small box, unwrap, and it expands right in front of your eyes. verrrrry easy and also ideal for small spaces. i also like that even though it’s covered up by sheets, the pretty grey and white stripes are on there. i appreciate those design details. not to mention it’s comfortable and gives me a more even sleep position instead of rolling into the middle of my mattress every night! 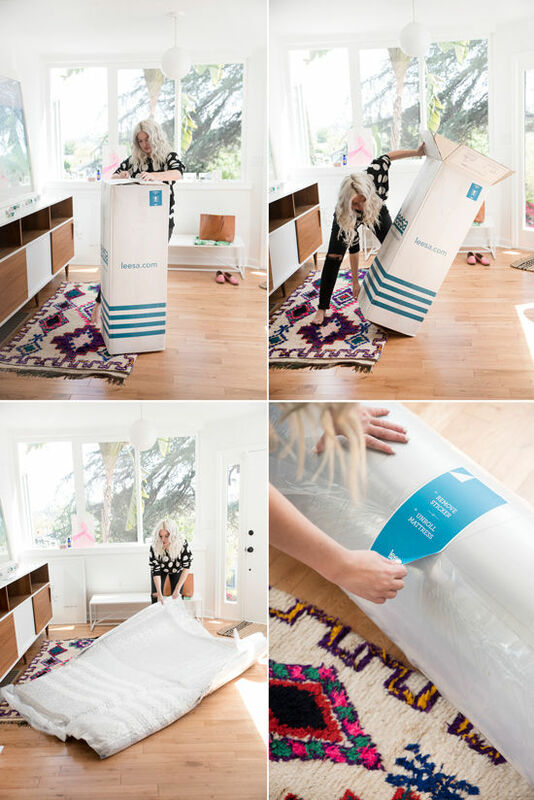 try the mattress out for 100 days and return it without any hassle if you aren’t into it! and they’ll take it back with ease, without a whole laundry list of rules you have to follow to get your money back. use the promo code DLF for $75 off your purchase if you’re interested in trying it yourself. another detail i added are my new wooden closet doors with gold handles (shop here). i worked with a contractor to build the new doors. there were those ikea sliding fabric panels when i moved in, and i wasn’t really a fan of the color and how masculine they felt. i wanted something easy on the eyes and a little more unique than just white doors. i’m really into the raw wood look in decor right now, so i just went for it. i love how they look with the new light too (from ikea!) i added a wood trim at the top to cover up the track and keep it clean. there are a few more things i want to do in the bedroom before it’s fully finished, but it’s getting there!! (this post is sponsored by Leesa, a cool company that makes a really comfortable mattress). use the promo code DLF for $75 off your purchase! Hey, could I ask where your actual frame is from please? Beautiful! the colors and the wood in the closet so lovely!!!! did you get a new bed?! where is it from? the bed is from yliving, but the headboard is still in the mail that comes with it! Hi! I’m thinking of getting the same light from ikea, but i was wondering howmuch light it actually allows through! Also, do you know how high your ceiling is? Just for measure? 🙂 Thanks! PS. Obv, I LOVE this room! don’t know the height of my ceiling, but i love the warm light this pendant gives off. i have mine on a dimmer too, and it’s really nice. Where did you get your bedding? I’m looking for baby-pastels, and having a hell of a time. i got them from a company called bodie and fou! It looks amazing! I’m trying to finish up my bedroom right now – a new mattress sounds wonderful! Love the color palette, such a perfect place to dream! Where did you get the colorful rug in the second photo (4 pic collage)? I’ve been looking for something similar forever!!! pink rug co on etsy! Thanks Bri! I’m definitely their new fan girl! What are the beautiful paint colors of the walls and the ceiling? Please include the brand of paint, the name of the colors and the sheen level. Thanks!!! What are the amazing paint colors you use?! Beautiful room! Where are the bedside lamps from? I’ve been looking for something just like them! sorry, those were already here when i moved in so i am not sure! hi! where are your side tables from?! Hi! I love the picture above your bed and the colorful pillows, where did you buy them from? How would you say this mattress is comfort-wise compared to a regular memory foam (like Serta or Tempur-pedic)? I’m considering one for a tiny house I am moving into, and am having a hard time with the idea of giving up my Serta iComfort. 🙂 Your room looks lovely~ a wonderful place to dream. hey christi, the mattress i had before this was a pillow top so i can’t really speak to other memory foam mattresses but i really like this one. it’s supportive without being too firm, and you also don’t get that sinking in feeling that some memory form mattress have that i don’t like. and it’s such a reasonable price compared to those other brands and such an easy delivery process! Where did you get your pillows? i love them! I LOVE the gray walls, do you know what color is it?? 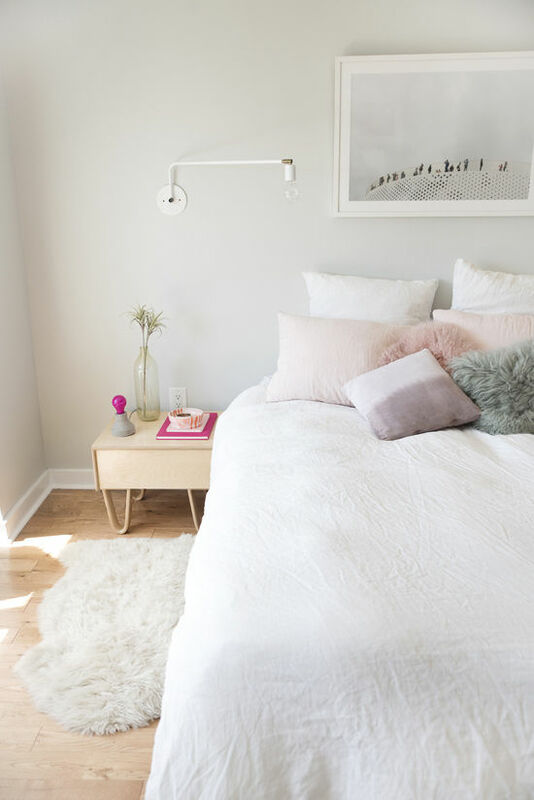 Can you tell us where the pillows are from and can be purchased? Beautiful! Can I ask what your wall color is? Thanks! unfortunately we don’t know the color. it was painted this way when bri moved in. I was wondering if you know how your contractor tackled the job of the closet doors. 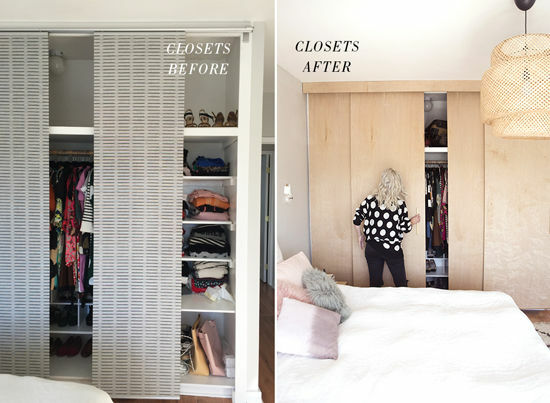 I have a similar closet that is really wide and tall, so typical standard closet doors don’t work. When I moved into my house, there was a system of 3 door panels on 2 tracks, and it was always impossible to access the full part of the middle section, due to this. I ended up taking out the middle panel, but would eventually like to come up with something nicer. Any additional information or pictures would be super helpful. Thank you! 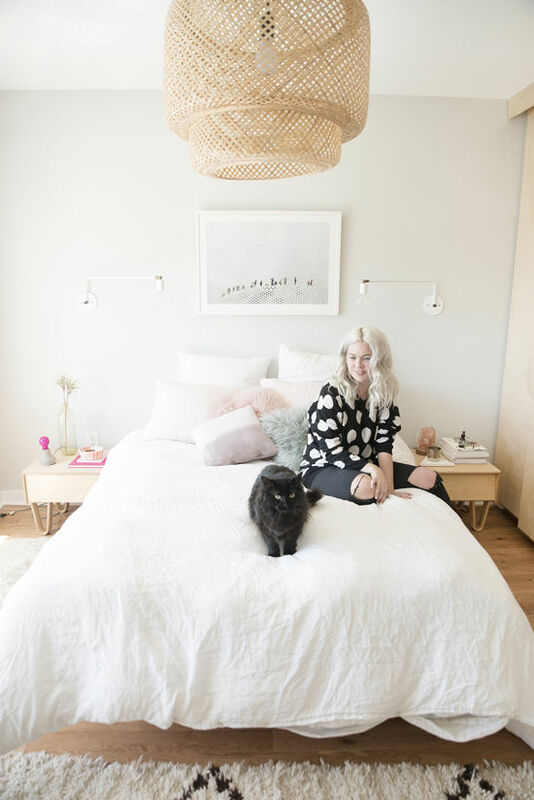 Hi do you happen to know where the print hanging above the bed is from? Thank you! Do you mind sharing the name of the contractor with whom you worked to build your closet doors? Thx. Hi yes! Are you able to share who your contractor was? Thank you!